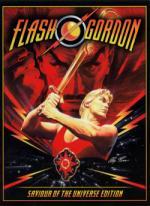 Oh yes, Flash Gordon would be a great addition to your collection. The movie is a bit silly, but it is very entertaining. Definitely worth seeing. Here's the version I have..I found it on sale last year, I think at Amazon. There aren't many extras, but I'm still glad I got it. I'm a Baaa-aad Boy! I peaked! Sounds like the movie I fell asleep on in High School! But don't worry... I would still give it another try! Hopefully, you'd see it now as all part of the fun. If you ask me, there is no better band in the world ever than the mighty Queen... but Flash is camper than a row of tents, so you have to take it tongue in cheek and then it's simply wonderful. It's on sale again at Amazon. Here's a link and everything. hmmmm... not sure I would call $15 on a $20 DVD much of a sale. I will probably wait till it is under $10 before I pick it up. (preferably quite a bit below). Pick pick. It's still a sale. :p and it's an entertaining movie..way better than Date Movie. Though I remember you paid way less for that one. Flash Gordon is certainly a Guilty Pleasure but as such worth watching. Yeah... if I find Flash Gordon in Walmart's Bargain Bin it will be mine! Marketplace is your friend in those case where you are not sure. Another good chapter with a great cliffhanger. One thing I could never understand about these superhero shows. One of the bad guys are shooting at Captain Marvel... and the bullets just bounce off him... just like they do on Superman. But yet right after bullets bouncing off him... the same bad guy breaks a chair over his head and he stumbles backwards and is knocked out. Oh well... these shows are not perfect... but they are a lot of fun. It's a bird, it's a plane, it's a frog...no, it's Disney's 'Underdog' - a flying, talking canine caped crusader! After an accident in the mysterious lab of mad scientist Dr. Simon Barsinister, an ordinary beagle named Shoeshine finds himself with extraordinary powers... and the ability to talk! Armed with a fetching superhero costume, Underdog vows to protect the beleaguered citizens of Capital City and, in particular, a beautiful spaniel named Polly Purebred. When a diabolical plot by Barsinister and his overgrown henchman Cad threatens to destroy Capital City, only Underwear...(oops! )...Underdog can save the day. Based on the original hit animated series 'Underdog' - your family will love watching the next great hero take a big bite out of crime. My daughter and I decided to watch a movie together this morning. We picked Underdog since I am already doing a bit of a Superhero marathon off and on here lately. The cartoons this is based on were pretty bad for anyone but the younger kids.... but the movie is a good, fun movie for the entire family! I really enjoyed every minute of it. This movie is a great addition for any family library. Billy Batson is held captive in an Oriental henchman's vault. The Scorpion didn't count on Captain Marvel ruining his plans. This is a good chapter... but not as good as some of the others. Pretty much this whole chapter felt more like filler to me then anything else. The cliffhanger for this one is only OK... it is just a "Will Captain Marvel get there in time?" cliffhanger. I haven't mentioned anything on the quality of this dvd yet... it is impressively good. only minor problems with the image here and there... and very good sound. Over all it is very crisp and clear. They did a good job remastering this serial.